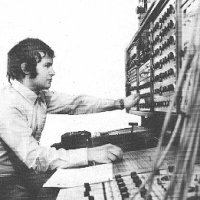 One aspect of the work of the BBC Radiophonic Workshop is the composition and realisation of signature tunes and incidental music for BBC radio and television programmes. Programme producers come to the workshop with varying requests - it must be bright, catchy, sinister, modest, supernatural, funny and so on, but most important it must be unique in terms of sound qualities. The composer then sets to work to create the tune using natural sounds, which have been manipulated in some way and cut together on tape, or electronic sources, such as the voltage controlled synthesiser. Several such signature tunes are included on this record, composed by Paddy Kingsland, who joined the creative staff of the workshop in 1970. Before this he worked as a tape editor, then studio manager, chiefly for Radio One. He is a firm believer that instrumental sound combined with electronic and treated sound is essential for this type of work. The tracks on this record include compositions for Radio 1, 3, 4, local radio and television programmes. The synthesisers used on this record are both British, and both made by E.M.S. of London. They are the VCS3, an amazingly versatile miniature synthesiser, and its big brother the Synthi '100', known within the Radiophonic Workshop as 'The Delaware', after the address of the workshop. This machine incorporates a digital memory that can be programmed via a conventional keyboard, and can store 256 events on 3 layers in any one 'run'. In combination with the multitrack tape recorder it provides all the facilities of an electronic music studio , its range being limited only by the imagination of the person using it. The specially created stereo is not an attempt at realism, but is used as a sound object in its own right. Photo: Paddy Kingsland The BBC Radiophonic Workshop provides a creative service, varying from complete background scores of electronic music for radio and television productions, through sound for poetry and science fiction, to signature tunes and experiments in stylised stereophonic sound. Apart from electronic music for 'Dr. Who' the workshop makes major contributions to television drama, documentaries and children's programmes, to drama and schools programmes on radio and to many local radio stations. In all more than 200 different commitments a year are undertaken. The Workshop, at the BBC Music Studios in Maida Vale, London, is equipped with tape recording machines and other electronic equipment for generating, manipulating and synthesising sound. The composition and realisation of this music and sound is done by a small number of specialised creative staff.